Generally as a religion matures, its rituals become fixed and unvarying. This preserves something fine from the early times; it also tends to breed mechanical repetition and to block the heart’s natural tendency to respond with newness and freshness. Ritual can be the death or the life of religious practices. We are blessed to live early in the story of Amma’s participation in our world, and to have Her showing us how vibrant and spontaneous ritual can be. Consider what She does with lotuses during Brahmasthanam pratisthas. In Mumbai (Nerul), seated in the inner sanctum, Mother took a completely closed lotus bud and gently, slowly, petal by petal, opened it – made of it a fully bloomed flower. This She placed purposefully on the base which soon would support the murthi (the image; in Mother’s temple, a four-sided stone image signifying that though there are many faces or concepts of God, the Divine is One). In Mananthavadi last February, a brahmachari opened each bud and gave Mother what appeared to be full-blossomed flowers. She placed one on each corner of the base that She was preparing for the murthi, and then added others halfway between the corners; the last one She held close to Her heart, meditating long. In Coimbatore three months later, She continued Her variations on the theme of lotuses. This time, She again received them all already opened. But instead of placing them immediately on the murthi base, with both Hands She held them near Her bosom, gazing intently at the profusion of pink softness. Decisively and gently She raised them and buried Her Face – mouth, nose and eyes – in their tender darkness. How long did She stay that way? It was not a quick sniff, nor a sudden magical breathing into them of Her life energy… it was a lasting communion. Finally She lowered them till She could press them firmly and softly to Her Heart; a small and mysterious smile rested on Her lips while Her closed eyes maintained Her secret world. Something very precious was occurring, but only Mother understood what. In ancient times Bodhidharma went from India to China, and it is said that for many years he meditated at the Shaolin monastery. He devised a system of physical exercises which served both as a means to maintain the health as well as a system of self-defense. The martial art he developed was Tai Chi. In recent times this art has found wide acceptance all over the world as a means to maintain physical and mental well-being. Now this art has been introduced to the ashram residents in Amritapuri. The Tai Chi camp started on the 30th and will go on for ten days. It is being taught not as a martial art but as an aid to meditation and a means to increase awareness. 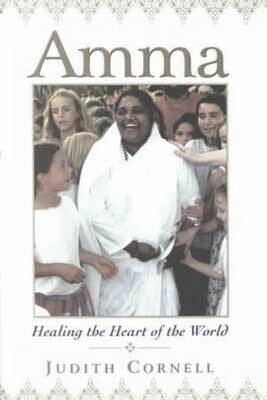 American author, Judith Cornell presented her newly published biography of Amma to the beloved Satguru Mata Amritanandamayi. Amma accepted, blessed and offered the book to the world. It is a heartfelt and revealing biography of One inspired to alleviate the sufferings of humanity. The book tells the story of Amma’s life in a new way. Drawing upon archives made available by Mother’s ashrams in America and India as well as upon personal interviews with people such as Amma’s own birth parents and nuclear physicists, this unusual biography helps western readers, perhaps less familiar with Indian thought and culture, come closer to an understanding of “the hugging saint”. ‘Amma, Healing the Heart of the World’ is a moving tribute to an inspiring life and an awesome spiritual force. 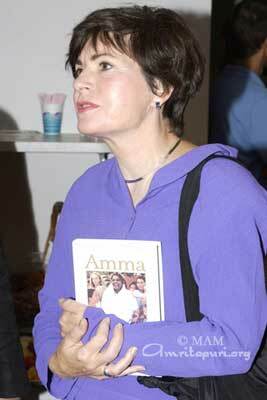 Don’t be surprised if you see shots of Amma autographing the biography. For the new biography is already available in bookstores across the country. It is also, of course, in the bookstall at Mother’s programs, which is how it happens that frequently during darshan Mother is to be seen autographing it. A Wednesday in the middle of May was the last day Mother gave public darshan at Amritapuri before this year’s Japan/USA Tour. That was the day She started at around ten and finished only at the end of evening bhajans. There was still a week left before Her departure. What did She do with all that free time? Here’s what: from about eight in the morning until four the next morning, people waited in small and quiet queues. Some of these formed at the bottom of Her steps, where on ordinary days She stops to play with Ram after bhajans; others formed on the bridge that connects the kitchen above Her room with the main ashram building’s fourth floor balcony. Slowly the people in these queues moved closer and closer to the door to Her room, and eventually each person would enter. These people were the ashram’s permanent residents: brahmacharinis, brahmacharis, householders, and westerners (the appellation given to all non-Indians, whether from California or from Japan or from Australia). Imagine going into Her own room, finding Her sitting alone either in the white-covered chair, or on the edge of a cot, or maybe on the floor – waiting for you. Waiting to let you ask Her anything – whatever your heart has yearned to ask. Waiting to reassure you that while Her Body goes far away, She feels no sense of separation from you. Waiting to embrace you without the rush and press of someone holding and tipping your head just so (lest you inadvertently knock Her cheek – the one with the permanent bruise) and someone else already pulling you away so that the next person can be guided close. It’s just you and Mother, and after you leave you go somewhere alone so that you can be quiet and replay this remarkable event enough times to be sure it will never be lost from your memory. When She’s away, you will have this to relive in your heart, again and again, helping in the loneliness. For unlike Mother, most of us haven’t reached that state of no sense of separation. Is that all? For over a week, for twenty hours a day, She just sits and advises and comforts, teases and consoles, gives playful pinches and motherly hugs, to Her ashramite children? No; somehow She is also fielding phone calls from all over the world; She’s making decisions; She is directing the schools and the hospitals and the orphanages; and on the side She’s reading urgent letters…. Twice She even managed to come for evening bhajans. (If She never left Her room, when could it be cleaned?) But playtime for Ram at the end of bhajans didn’t happen; it would have cost the time of at least four more private interviews, and there are only so many minutes in the day-and-night. So that’s how Mother spent Her vacation. Today, the 16th of May, is the last scheduled public darshan before Mother leaves for the six-week US Tour. Mother came to the temple shortly after ten in the morning, and it is now nearly seven in the evening, bhajans should be in full swing, but they aren’t, for still the temple is crammed full and Amma is sitting just where She has been for the past nine hours, hugging Her children. Seven thousand tokens on a Wednesday. After 16,000 on Devi bhava? That’s right. That’s Amritapuri before a foreign tour. Will Mother visit our homes? The leaders of the villages Mother is adopting in Gujarat made the long train journey to southern Kerala just in time to see their new Mother before Her departure for the US Tour. Representing the people of the villages where Mother is helping reconstruct homes, schools, churches, temples, mosques and clinics, these men of the earthquake-devastated Bhuj area of the north-west corner of India came to Amritapuri on Tuesday, 15 May, to extend a personal invitation to Amma. Smiling warmly, rubbing the speaker’s chest just over his heart, and then perhaps grasping his prayerful hands in Her own two Hands, Mother gave each the same basic reply: “When the reconstruction is finished, Mother will try to come for the opening ceremonies.” This would be a special prasad for these new children; something rare and beautiful would grace their shattered homeland. After their darshan, since Mother had told them to sit near Her for some time, the men gathered on the floor to the right of Her bench. They were sarpanches and other village leaders and one swami. This swami’s school, serving the local children, had been completely flattened by the earthquake, but not a single child had been killed! They spoke of the work going on now at home, saying that they were very grateful that it was Mother’s offer for adoption that they had accepted, for it is only Her people who had already launched so fully into the construction work. Others were awaiting the Government’s promised contribution of 50% of costs. As is generally the case, government action gets under way slowly, with so many bureaucratic steps to be taken first. In Mother’s world, Her decision to act is the first step and action itself is the second. This is the understanding of needs and the commitment to action that characteristics Mother’s children’s relief work everywhere. And this is why the people of Her adopted villages are so satisfied with their choice. There is more to why they are satisfied, of course. As they discussed when they made the choice, they believe that the land itself will be made holy if Amma sets Her Foot there. Now they have reason to hope that that day will come! During the last few days before Mother leaves for any extended tour, especially one to foreign countries, as if determined to have a final long swallow of water before crossing the desert, people converge on the oasis of the ashram. The crowds are huge. Baths start at about two thirty in the morning. Meal lines snake in endless convolutions. Queues form long before the token counter is to open. During the day the temple balconies are packed and so are all available stair-wells-especially those with a view of the temple stage. Even the front steps of the temple are jammed full, as people wait for their turn. In the evenings, people take their seats early to get close to the big stage for bhajans out in the huge new program hall south of the temple building. On Sunday Mother started darshan ten minutes before ten in the morning. Even though many devotees do not go to morning darshan, choosing to come only once when Mother will embrace them in Devi Bhava, still there were about five thousand people for morning darshan. By noon, thirteen thousand tokens had already been issued for Devi Bhava; by dinner time, the total was fifteen thousand -and the counter would not close until twelve midnight! Having left the temple at two in the afternoon, Mother was out again for satsang, meditation and bhajans before five in the evening. Bhava darshan itself began at 7.30 in the evening. By maintaining the incredible pace that is usually seen only on Her Birthday or in certain cities like Kozhikode (approximately 1150 hugs per hour), Mother was able to rise from her chair at ten the next morning. Having hugged at least sixteen thousand of Her children, Amma stood for yet another ten minutes, showering the devotees with flower petals: Hands filled to overflowing with blossoms, and completely still-except for Her Eyes, which moved slowly over all Her children, and at last looked up at only-She-knows-what before they closed and the doors were shut. Her Hand over Her Heart, and gazed again at Her children assembled below-every bit the Mother reluctant to leave Her children. It was ten thirty, Monday morning. For almost all of twenty four hours Amma was with Her children, talking to them, singing bhajans or giving darshan. This particular Sunday, when Devi Bhava began, it was Mother’s Day – if not in India, then elsewhere on the globe. When asked what She is “really” doing when She hugs people, Amma has said, “I am trying to awaken the motherhood within them.” Elaborating, She has explained that every human being, male or female, has the capacity for “Motherhood”: the capacity to be generous, open-hearted, compassionate, patient, accepting, and unconditionally loving. This is what She wants to bring to full expression in each of us. She was certainly doing Her part this Mother’s Day. Are we? The last afternoon darshan in Coimbatore. The stage is packed-as usual. But the majority of devotees seated there to Mother’s left are children, girls and boys in green-checked uniforms. Why is there so much space between them? Ah! Many are sitting with their legs stretched out in front. Their legs are in braces. They range in age from five or six to fourteen or fifteen years. And most if not all of them have come to see Amma for the first time. They are from The Society for the Aid of Handicapped Children, which for thirty years has served the needs of the handicapped in Coimbatore. Today, the children have come to meet Mother at Her “home” (one of Her many homes: the ashram), for, as She has explained, for Her to accept their invitation for a daytime visit to their home would result in too huge a crowd. Each child has already had his or her personal darshan-Mother’s embrace and whispered endearments. Now each gets a chance, for one minute, to hand Amma the prasad (a sweet wrapped in a small envelope of sacred ash) that She will then give to each person who comes to Her lap. No child is left out. Leg braces make getting into position next to Mother difficult, so adjustments are made: some children sit or kneel on the stage next to Mother’s peetham, but those who can’t adopt this regular position are helped-supported or actually lifted-onto the peetham itself, and they sit in whatever fashion works. One of the adults from the Society is just next to the prasad-giver, helping the child to know when to place the prasad packet in Mother’s Hand, and sometimes helping him or her to stretch far enough. The minute someone’s turn is up, another helper is there to lift the child away and move the next one into place. Nearly five in the afternoon; darshan must finally come to an end so that the area can be set up for the Sani Puja, the last program of Amma’s Coimbatore visit. The children are still seated at the side of the stage when Mother rises, salutes the crowd, and turns to go to Her room. At the edge of the stage, She pauses, and looks down at the eager faces of the children. She steps down and tousles the hair of the boy closest to Her path. She playfully pats the next child, too, and then stops and holds the third child close for a moment, gazing at all the others as if to say, “This hug is for you, too.” You can see the reluctance on both sides, Hers and the kids’, as She finally moves away and heads up the stairs to her room. Some of the children walk fairly well on their own; some just need someone’s steadying hand; the others wait until someone hands them their crutches, and then the group is moving fast-out to the parking lot and up the bus steps with the aid of a friendly boost or someone’s strongly lifting arms. More happy faces are at the bus windows; salutes and waves and “Bye bye!” and the day’s big outing is coming to an end. Despite Amma’s protestations that She really couldn’t go, in daytime, to the Society for the Aid of Handicapped Children, She did. Next morning, at just about the time that families of non-residents were bringing their children for physiotherapy, and just when traffic for the nearby produce market was growing heaviest, Her car turned in at the front gate. She had promised that She would stop by briefly before leaving town, but everyone had supposed that meant before dawn (it was assumed that She would leave straight after darshan). But here it was, full daylight, and Amma was walking in the front door! To Her right was a small display: medals and cups the children had won in Special Olympics and other athletic events; handmade greeting cards and envelopes, and handkerchiefs with embroidered edges. These are tangible proofs of the children successes in two of the goals of the Society: to help them “overcome the handicap and be a part of society” and to provide “meaningful vocational training to enable the handicapped to become economically self dependent.” These cards and handkerchiefs, along with other items the children learn to make in their Occupational Therapy classes, are sold. Mother was visibly impressed by the fine artistry on the cards and hankies; She looked closely at them, holding them with Her gentle fingers. The children were in the prayer hall, about to go for breakfast, but of course they stayed put when Mother walked in! Amma moved straight over to where the kids were sitting on the floor. Someone placed a chair for Her, and She sat for a moment, but in the end She couldn’t stay so far away, so She abandoned the chair and squatted down near the children. Handing a banana to this girl, an apple to that boy, a handful of nuts to that other child, She saw to it that everyone received prasad from Her Hands. Her Hands – such expressive Hands – expressive, indeed: for recognizing that the handicap of some of the children was deafness, She began signing! Now here is a language that bridges the gap between Malayalam and Tamil! She signed, they signed back-successful communication! Fondly caressing the hair of the child nearest Her as She finally stood up, Mother looked lingeringly into all the faces there, and then turned to bless their home’s prayer room with a puja before She left. Her visit was a blessing to others as well, for it was a reminder of one of Her frequently repeated teachings: we often cannot change external circumstances completely to our satisfaction; what we need to do then is to change our inside responses. The Society for the Aid of Handicapped Children certainly makes every effort to change externals-it provides surgery, physical therapy, occupational therapy, work opportunities for people whom the ordinary work-world too often overlooks-but in the end the children still are amputees, or deaf, or mentally retarded. What a blessing that the Society also has great success at helping the children develop positive mental attitudes about themselves and about coping with life as they find it. They are taught to seek a balance of effort and acceptance: another of Mother’s essential messages. No wonder Her Heart couldn’t resist the pull of their longings for Her visit! Between the hours of eleven in the morning and one in the afternoon on Wednesday, the 2nd of May, 2001, Amma consecrated a new Brahmasthanam temple at the new ashram in Coimbatore, Tamil Nadu, the southern state neighbouring Her home state of Kerala. At Mananthavadi just over two months ago, the ceremonies were on two consecutive days, but here She performed them in less than three hours. A crowd of over eight thousand had gathered to be a part of this very holy event. Going first to the small temporary structure at the crest of the temple roof, Mother performed the Stupika pratishta. As always, birds seemed drawn to soar above the temple during the ceremony:(it is considered to be an auspicious sign) first a single large eagle circled; then it was joined by two others, and the three inscribed a triangle directly above Mother. By the end, about ten birds had gathered and were soaring in an upward spiral. One wonders what it is these sensitive creatures are experiencing! After the Stupika Pratishta, Mother descended and immediately entered the temple, where first She prepared the ‘peetham’ the base where the four-sided idol (representing the unity underlying the diverse names and forms) would be placed. After the idol was carried inside, and the doors were closed, the crowd outside chanted “Om Shiva Shaktyaikya Roopinyai Namaha” until the doors again opened, and Mother first did an arathi to the idol, and then performed the abhishekam (pouring of pots of consecrated water over the idol). Finally Mother stepped back and the swamis also performed an arati to both Mother and the idol. The ceremonies concluded, Mother left the temple, going to Her room only long enough to change Her dress. Immediately She returned to the stage and spoke to the people.The real pratishta, She told them, occurs within our hearts, when we enshrine God there. Her satsang complete, Mother then led bhajans, and then proceeded to give darshan to the massive crowd. She left the stage only after 5:45 in the afternoon, and returned for the evening program (satsang, bhajans and darshan again) by 7:30 p.m. It was a full day, and night, for the night darshan finished only at 4:45 the next morning!